Sound Toys turn back the clock to bring some '60s grit into your DAW. There are software companies who bring out so many new plug-ins that it's impossible to keep up. Sound Toys' approach is the exact opposite of this: their range has only ever contained a handful of effects and processors, but the quality of those has always been outstanding, to the point where the announcement of a new product generates a palpable sense of anticipation. Much of the company's development work over the last few years has been devoted to the notoriously difficult task of modelling the non-linearity and distortion characteristics of analogue circuitry. This research has already given us the excellent Decapitator distortion effect, and its eventual flowering will be a comprehensive console emulation plug-in called Juice, which will compete head-on with the likes of Slate's VCC and Waves' NLS in attempting to recreate the sound of classic large-format studio mixers. Along the way, though, Sound Toys' team have turned their attention to a slightly more humble piece of vintage gear, resulting in the release of Radiator. Like the rest of the range, Radiator is available in RTAS, AudioSuite, Audio Units and VST formats. There's currently no AAX support, and Sound Toys have yet to make the switch to 64-bit, so people using 64-bit DAWs will find themselves running Radiator via a bit-bridge. This is unusual for a new plug-in in this day and age, but was in no way a problem, in practice, on my system running 64-bit Cubase 7 and 32-bit Pro Tools 10. Both AAX and 64-bit support are apparently in the pipeline. Radiator is a plug-in version of the Altec 1567A, a small rackmounting mixer which dates from the 1960s. At the time, it was widely used in sound reinforcement contexts, as well as at studios such as Motown. Like a lot of older valve-based equipment, it has since been rediscovered by artists like the Black Keys, and is now prized for the very qualities its original users probably hated: a strongly coloured sound that elides easily into saturation, with a generous helping of noise. Sound Toys' recreation lets you switch the noise off if you want, and also features a wet/dry Mix knob, but is otherwise faithful to the original. It is simplicity itself to use, boasting only input and output gain controls and treble and bass tone knobs, plus a switch that determines whether the microphone or line input circuitry is emulated; they present different loads to the input transformer, with subtle but audible differences in sound. Visual feedback is delivered by a single VU meter, even if you're using Radiator on a stereo track. This meter is fixed in position at the plug-in's output. Unlike the aforementioned VCC and NLS, there's no way to gang multiple instances of Radiator together under the control of a single master instance, nor is there a separate plug-in emulating mix-bus summing. This is entirely understandable when you think that the original 1567A had only five inputs and was never intended to be used like a Neve or SSL. It seems clear, then, that Radiator is intended not as a vanishingly subtle process that helps a large multitrack mix coalesce when used across every channel, but as a character effect to be applied to specific sources. My review copy arrived almost at the same time as Waves' Abbey Road REDD plug-in, which I reviewed in last month's SOS, and there are some interesting points of similarity between the two — but also some contrasts. Perhaps the least welcome of the latter concerns CPU load: Radiator is a lot more processor-hungry than the Waves plug-in, and on an older computer you'd need to be careful how many instances you load at once. Abbey Road REDD can sound fantastic, but requires a fair bit of care to set up. This is partly because of a relatively complicated interface with a few obscure controls, and partly because the line from pleasant warmth to outright distortion is very easy to cross, especially in the plug-in's earliest REDD.17 model. Radiator, on the other hand, is gloriously simple to use, and seems to have a much broader 'sweet spot'. Given that Sound Toys use adjectives such as "gritty” to describe its sound, I wasn't expecting it to work well on sources like fingerstyle guitar or delicate female vocals, but it absolutely does. Something that can be frustrating about many 'warmth' plug-ins, including REDD.17, is that you can encounter a sudden headroom limit, where subtle saturation tips over into gross distortion on peaks. This sort of unwelcome surprise is refreshingly absent in Radiator, where the saturation on peaks seems much more gently progressive. On transient-rich material, especially, it's much more forgiving and easier to set up than any comparable plug-in I can think of. Another point of contrast between the two is that whereas the output fader in REDD is simply a digital gain control designed to balance the level of the processed signal, Radiator's input and output stages both contribute to its overall effect. In other words, you don't only achieve saturation by cranking the input gain, then attenuate the results to taste; turning up the output gain overdrives the circuitry differently, sometimes with audibly different results. Between them, these two dials make it very easy to control both the amount and the character of the saturation, the flip side being that once you've found the right setting, you might need to attenuate the output signal in your DAW rather than within Radiator. The treble and bass equalisers on offer here are not dissimilar in their effect to those in the REDD.17 version of the Abbey Road plug-in, but obviously they are not identical either! In both cases, they apply a broad tonal change which extends well into the mid-range at either end. This can be surprisingly useful, although boosting the bass tends to bring up 'mud' frequencies as well as true low end. The most obvious difference between the Line and Mic settings is that the former is pretty noisy and the latter is very noisy indeed, especially when you turn up the output gain. Turn off the noise — it is perhaps a shame that it can't simply be turned down — and the differences between the two modes are more subtle, but they can certainly be audible with some sources and settings. The Mic setting has a less linear frequency response, with a bit of a low-mid dip, while I formed the impression that the Line setting tends to round off transients a little more, producing a slightly smoother overall sound. Of course, Radiator doesn't just excel on folk guitar or breathy vocals. It's perfect for fattening basses, toughening up drums, adding a human quality to cold synths and generally introducing a healthy dose of dirt when needed. True to Sound Toys' description, it can get quite gritty on complex sources such as entire mixes or drum buses, and I didn't always like it in these contexts, but as a processor for individual tracks it's hard to beat. All in all, Radiator is an excellent example of what's good about Sound Toys' approach to plug-in design. It's ludicrously simple to use, yet offers a usefully wide range of effects, from fairly subtle warming-up to obvious crunch. 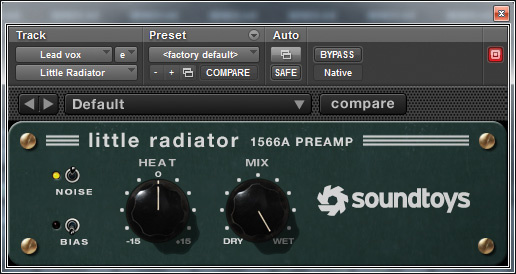 Most of all, unlike most distortion and warmth plug-ins, it's really difficult to make Radiator sound bad! Highly recommended. As a 'teaser' for the full version of Radiator, Sound Toys released a free plug-in called Little Radiator, based on the closely related Altec 1566A valve preamp. The free version of Little Radiator is no longer available separately, but it is included as a bonus with Radiator itself, and a very worthwhile bonus it is too. With only a single stage of saturation, it's even easier to use. Sonically, it's in the same territory, as you'd expect, and it too can go from subtle warmth to obvious distortion, but tends towards a slightly more direct and less complex sound than the full version. There are occasions when this is exactly what you want, and Little Radiator also has a switch labelled Bias which is not included in Radiator and has quite a noticeable effect on the character of the saturation. Effortless to use, with a wide 'sweet spot' on nearly all sources. Offers a range of effects, from the subtle to the obvious, all great. No 64-bit version or AAX support yet. There are many plug-ins around that aim to provide saturation and analogue warmth, but Radiator is at the top of the class. £102 including VAT; upgrade from free Little Radiator $89. Unity Audio +44 (0)1799 520786. $129; upgrade from free Little Radiator $89.